Two people were killed when their car was struck by a train in Bartholomew County. TAYLORSVILLE, Ind. 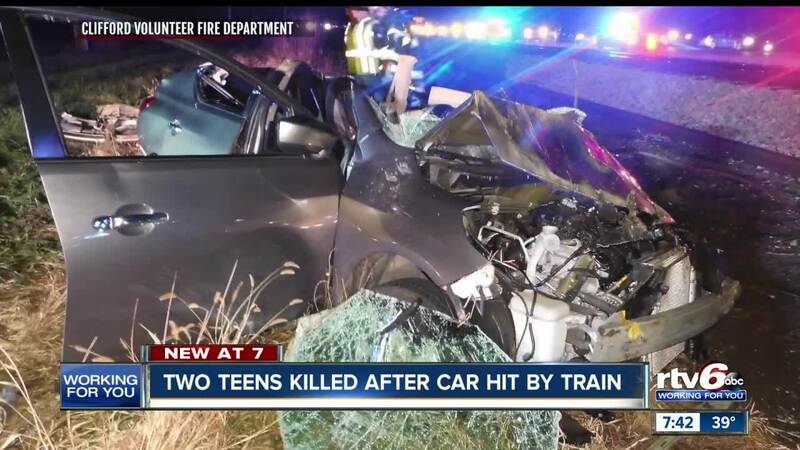 (AP) — Authorities say two teenagers have died after the car they were riding in collided with a train in south central Indiana. The Bartholomew County Sheriff’s Department says 18-year-old Matthew Newland and 17-year-old Carmyn Elkins were pronounced dead at hospitals following the collision shortly after 10 p.m. Friday. Both were from Columbus. A witness says a Nissan Versa driven by Newland turned from southbound US 31 to travel east on a rural road and failed to yield to the southbound train. The witness says railroad crossing equipment was working properly as the train approached, and the train sounded its horn several times. The car ended up in a field. The collision occurred near Taylorsville, about 35 miles south of Indianapolis.